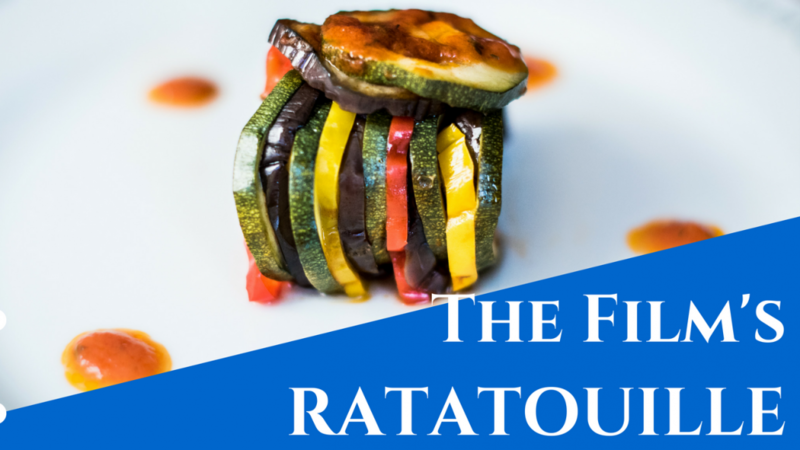 My goal is to collect for you the tastiest Food and the Movies recipes and I can’t help but start with the Ratatouille prepared in the lovely Disney’s animated picture by Remy the rat! The main idea of the screenwriters was absolute genius: who would want a rat in the kitchen, let alone in front of the stove? 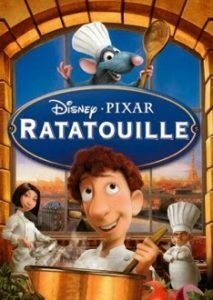 Nobody, but after watching this movie you would give anything to take a cooking course from Remy. Well, at the moment little Remy is not available for teaching his culinary secrets, he already spent too much time guiding Alfredo 🙂…lucky you I collected them all and I can’t wait to share. 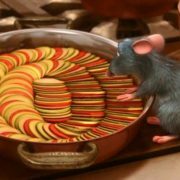 First of all, it’s important to underline that once Ratatouille’s producers decided to shoot the movie, they contacted as a consultant the best of the best of the best in terms of French cuisine experts in the States: chef Thomas Keller. Chef Keller is the owner of two restaurants, The French Laundry in Los Angeles and Per Se in New York, both awarded with three stars in the Michelin guide. 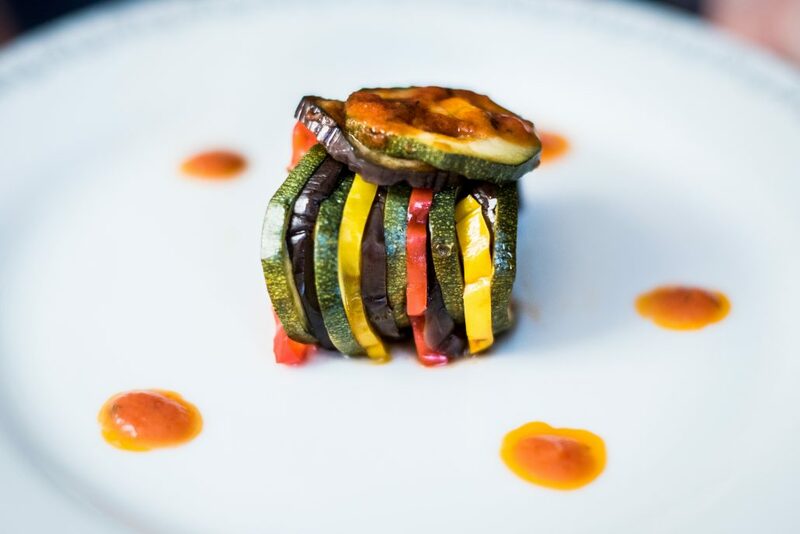 He was asked to invent a haute cuisine version of the iconic dish ratatouille: a vegetable stew cooked in all French countryside’s households by mothers and grandmothers. 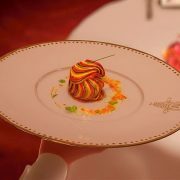 Moreover he had to describe to the writers the life inside a kitchen and “design” the look of all the other 146 plates prepared by Remy through Alfredo’s hands and by the other cooks of the restaurant. It took him a few months, but the result is absolutely perfect just like the movie itself! 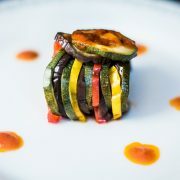 So perfect that the audiences from whole world wanted to know and try themselves the Ratatouille’s recipe inflamed by chef Gusteau’s famous motto: Anyone can cook! 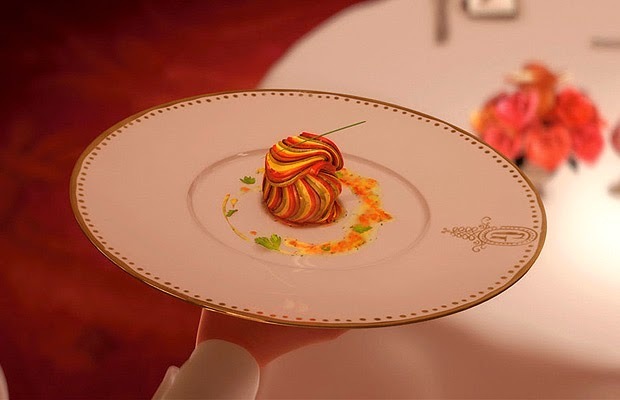 The film’s Ratatouille can be prepared in two different ways: the original one created by chef Keller adding a wonderful piperade (a little longer and more complicated, I have to say) and an easier version that reduces the time of preparation. Remy’s would of course use the difficult version and I, and maybe you, definitely go for the second one. 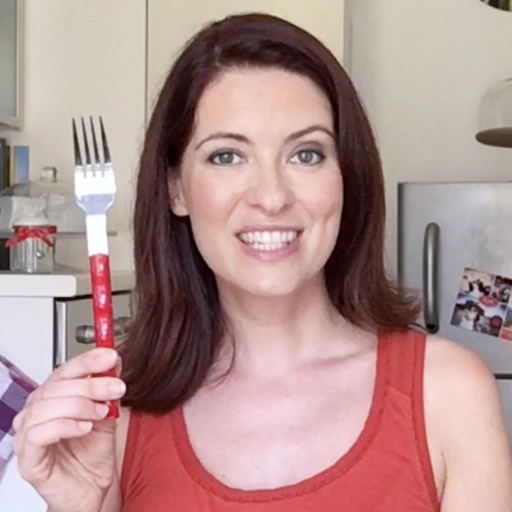 I loved the easier version so much that I also made a Skillshare video tutorial about it! So if you want to see all passages in video use the special link to subscribe to Skillshare for 2 months for free! Piperade: 2 Red Bellpepper (Capsicum), 2 tbsp Extra Virgin Olive Oil, 1 tsp minced Garlic, ½ cup finely diced Yellow Onion, 12 oz. Tomatoes – peeled, seeded, and finely diced, juices reserved, 1 sprig Fresh Thyme, 1 sprig Flat-leaf Parsley, ½ a Bay Leaf, Salt to taste. 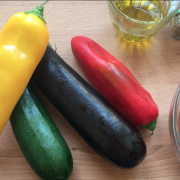 Vegetables: 2 Zucchini, 1 Japanese Eggplant, 1 yellow long Bellpepper, 2 red long Bellpepper, ½ tsp Minced Garlic, 2 tsp Olive Oil, Fresh Thyme Leaves, Salt and freshly ground Black Pepper. Vinaigrette: 1 tbsp Extra Virgin Olive Oil, 1 tsp Balsamic Vinegar, Thyme, Salt and freshly ground Black Pepper. 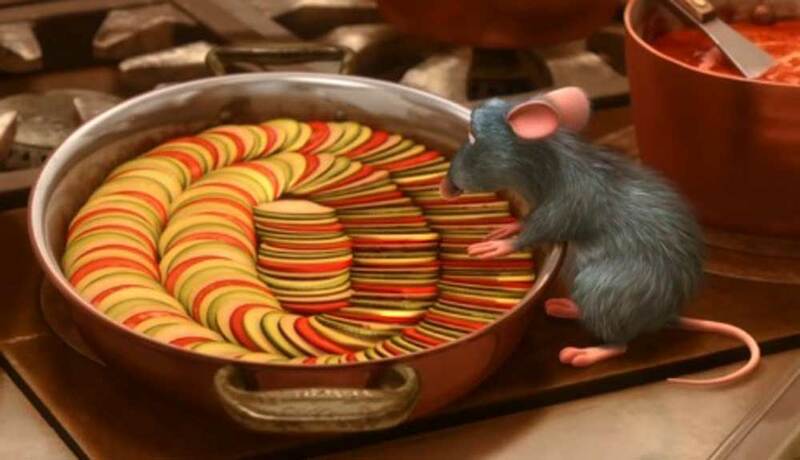 Remy arrives early in the kitchen, washes hands 🙂 and starts by preparing the piperade for the Ratatouille. He cuts the bell peppers in halves and removes seeds and ribs. He heats the oven at 450F then puts the bell peppers with the skins up on a trey with aluminium foil. After 15 minutes the skins should start to loosen. Remy lets the peppers to cool, removes the skin and cuts them into little pieces. 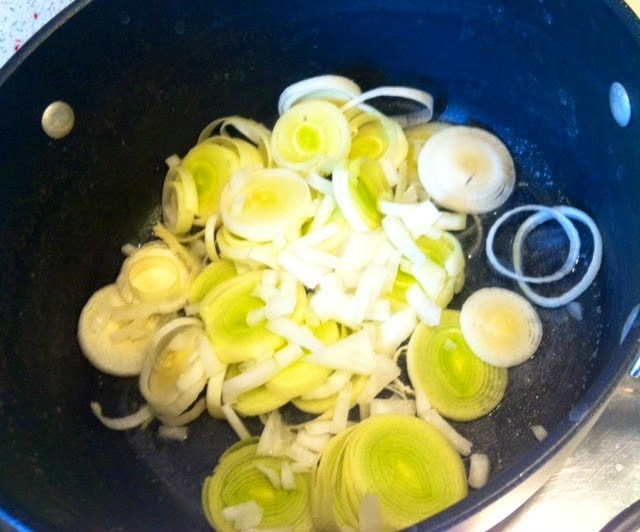 In a pot he cooks very gently in oil minced garlic and diced onion till golden. It takes about 8 minutes. Then, he adds tomatoes and their juices, thyme, parsley and bay leaf and lets simmer for at least 10 minutes till all juices are absorbed. Then he adds also the bellpeppers and lets simmer for another 5/6 minutes. He seasons with salt and pepper and removes the herbs’ leaves. While the piperade is prepared he cuts all the vegetables. To make them the same perfect size the best way to slice is to use a mandoline knife and Remy knows that! 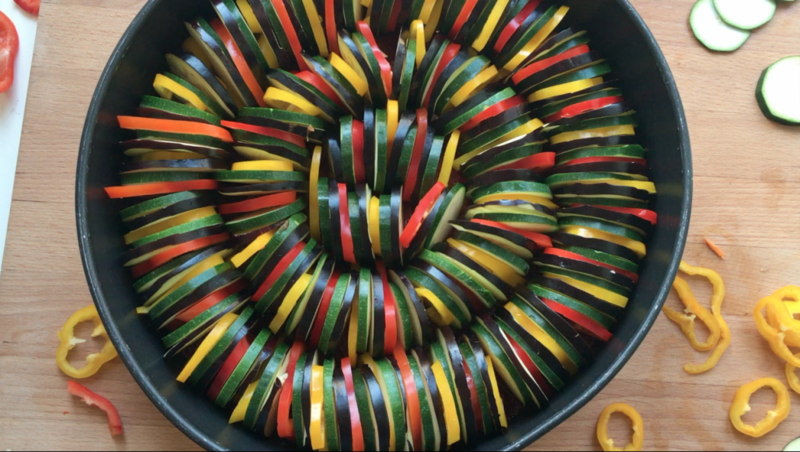 Once both piperade and vegetables are ready he takes a round oven casserole, spreads the piparede on the bottom and positions the vegetables in spirals alternating the colors (es. 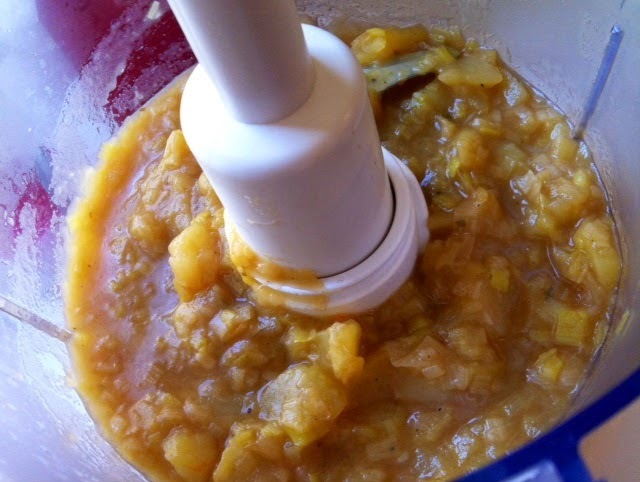 zucchini, eggplant, yellow bellpepper, zucchini, eggplant, red bellpepper…etc.). He seasons with oil, minced garlic, thyme, salt and pepper (see pics for composition). He heats the oven at a low temperature so the vegetables cooks very slowly and before putting the casserole in, he covers the vegetables with white parcamente paper to make all the juices remain inside. After the first 2 hours he removes the paper. Remy prepares a vinaigrette with oil, balsamic vinaigre, thyme, salt and pepper. He makes the most amazing plating and spreads the vinaigrette on top (see pics)! 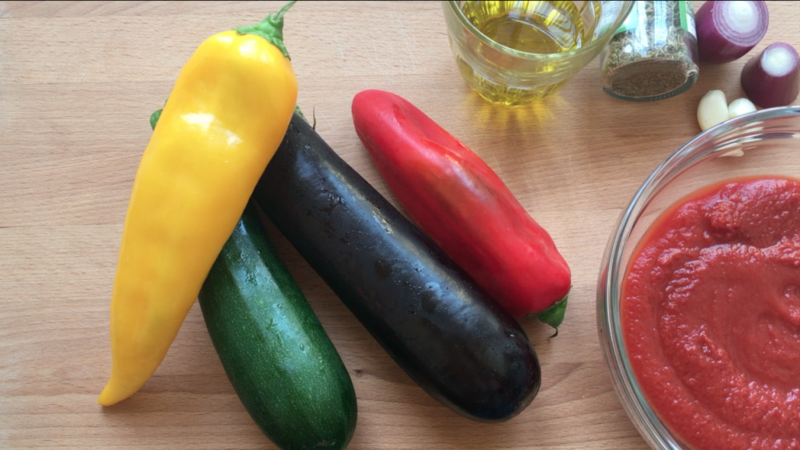 The two main differences between Remy’s version and the easier one are: 1) no piperade is prepared, 2) the vegetables are cooked at a higher temperature reducing the baking time. You can see all passages in my Skillshare tutorial! I substitute the piperade with 1 cup of tomato sauce that I mix in a bowl with 4 tbsp of olive oil, minced garlic, diced onion, thyme, salt and pepper. 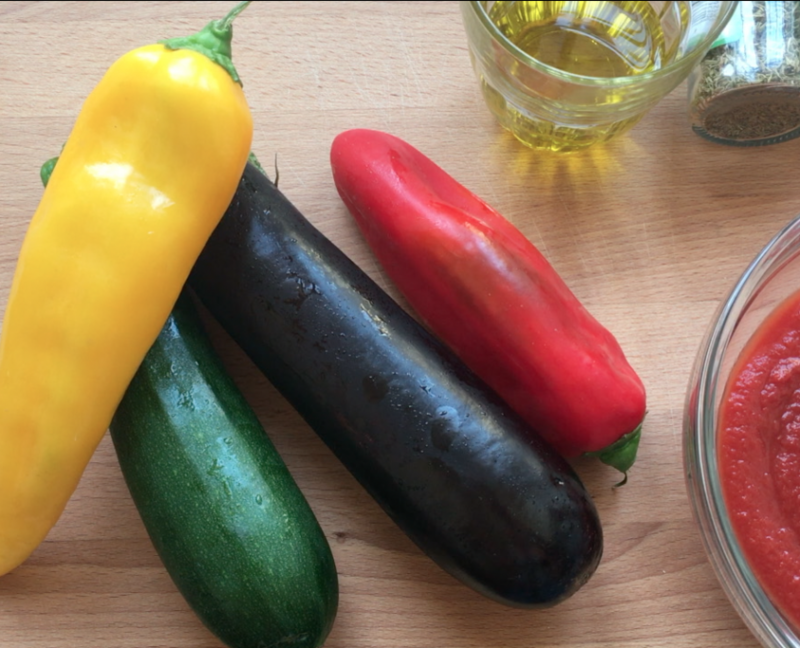 Then I start to slice the vegetables (zucchini, long eggplants, yellow and red bellpeppers) with a mandoline knife so Remy and Chef Keller are proud of me! Once all vegetables are sliced of the same size, I spread part of the seasoned tomato sauce in a round oven casserole, keeping aside a couple of spoons. 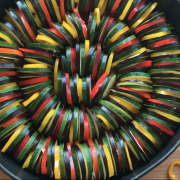 I create spirals with the vegetables alternating the colors and I spread the remaining tomato sauce on top, adding more oil, thyme, salt and pepper. I cover with parchment paper. I heat the oven at 380F and cook for 35 minutes, till the vegetables are tender. Subscribe in my Skillshare video tutorial to see all passages! 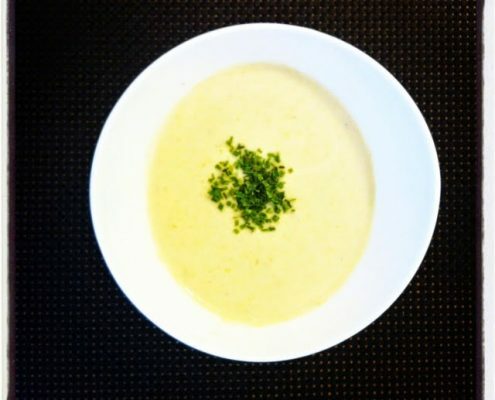 Since I love both this picture and cooking so much another recipe that I had to try is the Vichyssoise, a cold and absolutely delicious leek and potato soup. Why so? 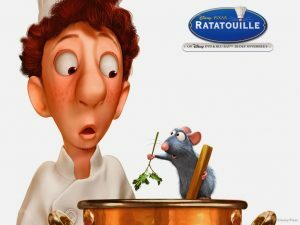 Even if the screenplay does not say it, I’m convinced that it is the soup that Remy saves after the terrible disaster caused by young Alfredo Linguini…you don’t remember the scene? Watch the movie again eating these two fantastic dishes!! 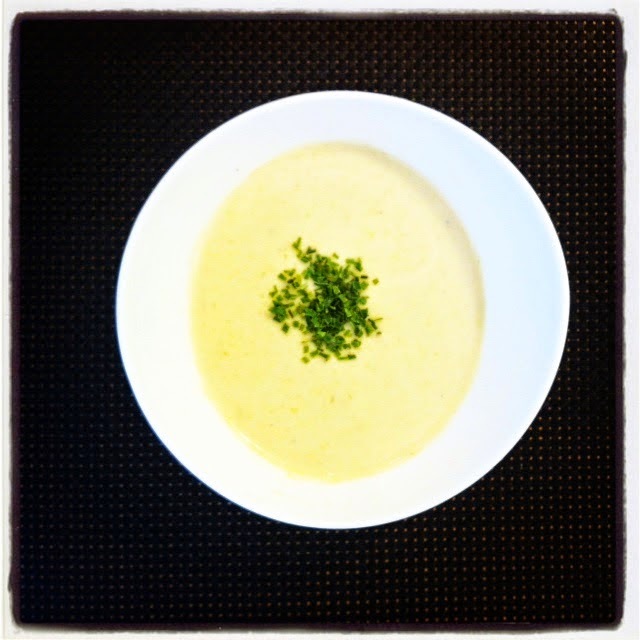 1/2 lb of potatoes, 2 leeks, 1/2 onion, 2 tbsp of butter, 4 cups of chicken stock, 1/2 cupl of fresh cream, chives, nutmeg, salt, pepper. Remy uses Alfredo’s hands to wash the leeks, cut away the green part and slice them. He chops the onion. He melts the butter in a casserole and cooks the leeks, the chopped onion, salt and pepper for 10 minutes on a very low flame paying attention not to make them become golden. 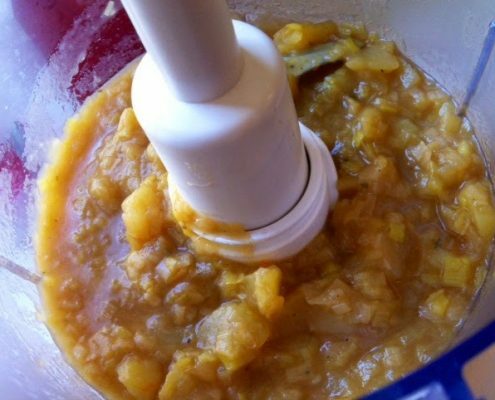 In the meantime he boils the potatoes also for 10 minutes, then peels them off and cuts them into pieces. He adds the potatoes in the casserole with the warmed chicken stock and a pinch of nutmeg. He makes everything boil, covers and has it cook for 30 minutes on a low flame. He checks that the potatoes are completely cooked and lets everything cool.